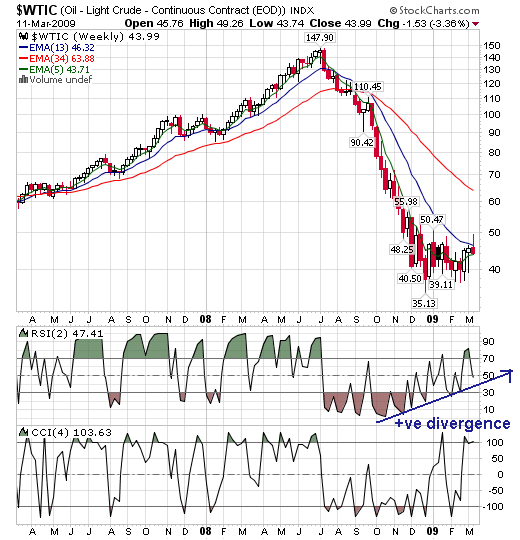 You are here: Home / Commodities / Crude Uptrend or Downtrend? Crude Trading near $43/Barrel achieves deadly low of $35.13/Barrel on October 23rd. Since then it is stuggling to move above $50 mark. Looking into tthe weekly charts with simple 5/13 EMA indicators, chart shows still no bullish 5/13 EMA crossovers i.e 5EMA>13 EMA. As per charts to have a such crossover crude needs to sustain above $48 mark during the end of the week. 13 EMA is a clear resistance now i.e $46.32 mark on Weekly basis. So sustainability above $46.32 on weekly basis will target crude to the next near term resistance 34 Weekly EMA of $63/Barrel mark. But Weekly CCI-4>100 suggest overbought levels in crude likely negative sentiment to remain till $48 breakout occurs on weekly basis.Also there is a formation of positive divergence in Weekly RSI-2 with RSI-2 supports near 40 levels. RSI failing to taking support near 40 levels is also a bearish factor.